No other building in New York City can compare to Frank Lloyd Wright's Guggenheim. 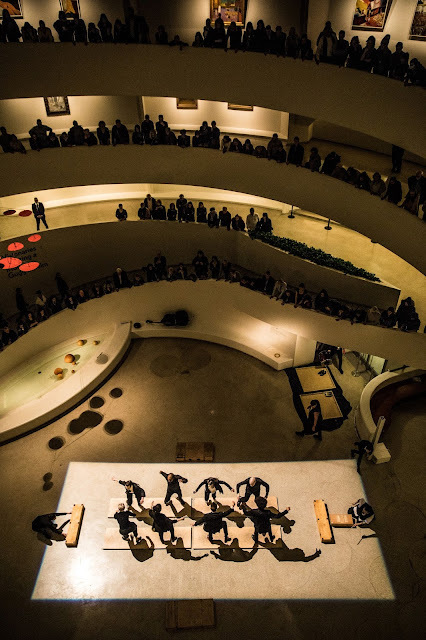 The spiral ramp that forms the rotunda may pose logistical problems when installing an exhibition, but who among us hasn't daydreamed of rolling from the top to the bottom on the ramp, ideally free of visitors? The museum is currently showing Visionaries: Creating a Modern Guggenheim, which is essentially a selection of core works elucidating the museum's mission, essentially the history of modern 20th century abstract art. 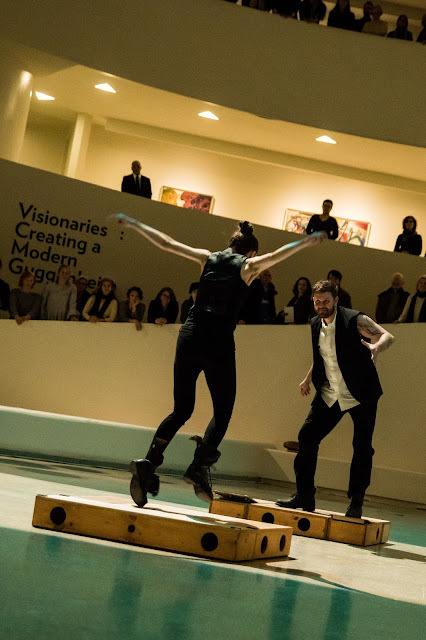 Michelle Dorrance and Nicholas Van Young, plus her company, were given free rein on Feb 16 to turn the rotunda into a giant instrument, with the full-house audience as participants. Dorrance is known for her imaginative tap choreography, but here the company for the most part wore street shoes (at least I think that's what they were, as I watched at a distance from the top level). As Dorrance whacked a drum, dancers pushed boxes on the ground (that comprised platforms when assembled), tracing figure 8s, and slapping or stomping on them to create sounds. A pair lay on the floor and posed in various shapes which read clearly from on high. 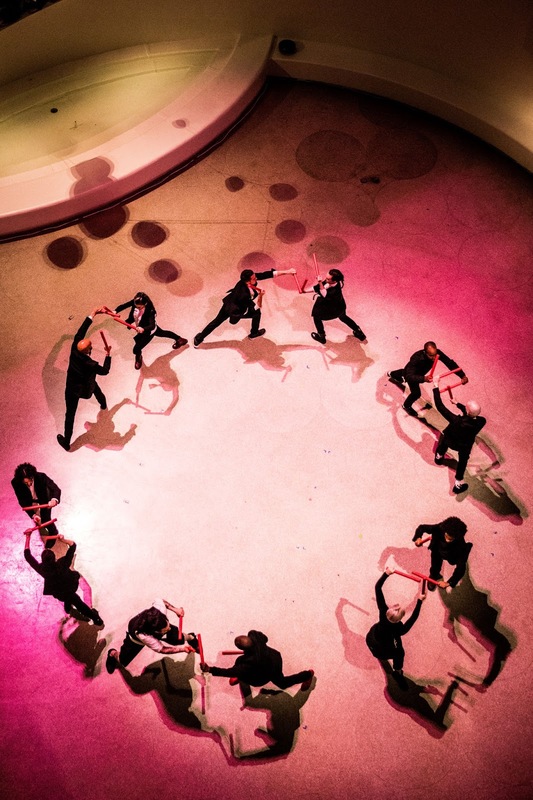 The performers hit together red plastic sticks, and mock dueled one another. A trio stood mid-level and sang out into the atrium. They then ran down the ramp for a circuit, repositioned themselves against the railing, and sang again. Just below me, a team with longer plastic tubes whacked them against the railing in rhythmic patterns. Van Young stood at the ground floor's center and conducted us, the audience, in alternating rounds of claps, varying in speed and pattern. It was remarkable how quickly people picked up what he was doing, and what we needed to do in response. He and Dorrance hit some spheres floating in the small pool (which I always forget is there), creating yet more types of sounds. Wooden platforms for tapping were dragged in, and the dancers carried their tap shoes out, laced them up, and made a cacaphonous barrage of reports which bounced around the rotunda. Dorrance's ingenuity emerged not only in the tap routine she performed solo, but in the simple yet effective section where most of the company marched in a looping line, each step resonating loudly. The event is part of the Works & Process Rotunda Project, which intends to activate the main gallery space. Dorrance/Van Young certainly left no area unused, showing the potential of the iconic space when in the hands of visionary creators. The next work in the series will be in September by ABT principal Daniil Simkin.